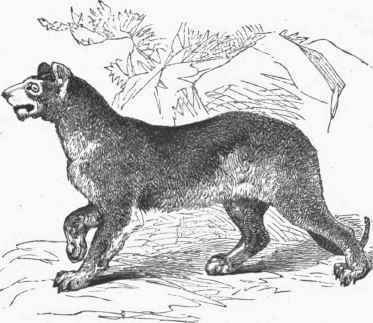 Couguar (Felis Concolor Linn), a carnivorous animal, also called puma, or American lion, and by the early settlers of the United States painter (a corruption of panther) and catamount. It has a very extensive range, being found from northern New York to Patagonia in South America. The length of the body of the adult male is from 4 to 4 1/2 ft., and that of the tail from 2 to 2 1/2 ft.; the females are somewhat smaller. The fur is thick and close, of a pale reddish brown color above, shading into white on the flanks and lower parts; the muzzle, chin, throat, and inside of limbs are grayish white, and the breast is almost pure white; the back of the ears, and the part from which the whiskers spring, are brownish black; the tip of the tail black; the whiskers white; on the face and sides there are sometimes a few stripes. The young have rows of dark brown spots on the back, and show other markings like those of the leopard. The couguar is an active climber, but prefers the grassy plains and meadows of South America, where it is very destructive to the herds. One of its chief peculiarities is its voice, which is shrill, and best described as a scream. In the forests of the north it lives chiefly on deer, upon which it springs from a branch overhanging their paths and watering places. It is not satisfied with seizing a single victim, but will kill as many of a herd as it can, sucking only a small portion of the blood of each. It is cowardly by nature, and will flee from man; but if wounded, it will turn upon the hunter, and prove a dangerous foe. In the north it is generally hunted by dogs, and driven to a tree, where it is easily shot. It is readily tamed, and many instances are on record of its docility and even affection.